Arbors make a great choice to enhance your garden entrance. A great option for an arbor is a metal one. Metal Arbors are not only dress up ones garden; they are great for growing vines. Metal Arbors seem to be the most popular in this case, as for growing rose vines. They are simple and pretty structures that defiantly do the job for guiding the roses. Most of the metal arbors are powder coated and made to withstand harsh weather. Once mounted properly, you shouldn’t have to worry about the durability of them. In most cases, mounting stakes are either provided or sold as an add-on option. In this case, they will come with detailed instructions for this process. For the most part, they are very similar in how to do so. The stakes would actually go directly in the ground, and then the poles (bottom portion of the arbor) would fit over them. To insure of extra sturdiness, you may want to use quick cement along with the stakes. 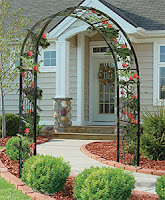 Even if you do not wish to grow vines, Metal Arbors make a beautiful entry way to lead a path!